If you need a vision prescription here are some sun protection options that you can see with! 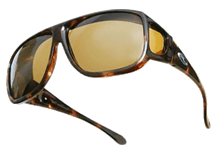 Prescription sunglasses are a great way to combine sun protection and optical prescription. They can be made as either single vision distance lenses or if you require both reading and distance then they can be made as progressive lenses and bifocal lenses. Costs: Vary, but would normally be quite similar to your clear prescription glasses. The best clip-ons are custom made to an exact fit of your existing glasses. They can be mounted by clips or magnets fitted into the lenses. The magnetic clips can easily be retro-fitted to your existing glasses. More information on Magnetic Clip-ons can be found here. Photochromic lenses are a convenient option that mean you can have sun protection in your every-day glasses. Photochromic lenses (also known as Transitions) are lenses that change colour in response to sunlight. They are a great option for convenience, however they don't work so well when driving as the darkening is activated by UV light not visible light which is blocked by car windscreens. There are many different colours and darkness options in photochromic lenses. Click here for more information on photochromic and transitions lenses. 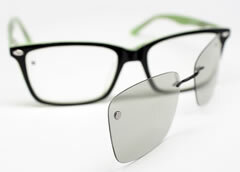 Fit overs are a cost effective sun protection option which are worn over the top of your existing glasses. The polarised lenses help to reduce reflected glare. Click here to buy Fit overs online from our web site. Julbo and Adidas do a great range of specialised sports sunglasses. These are light weight and come in different designs to suit different sports. There are designs for running, cycling, golf, and even water repellent lenses for water sports. Using contact lenses to correct vision means you can enjoy wearing all non-prescription sunglasses. Click to find out more about contact lenses.